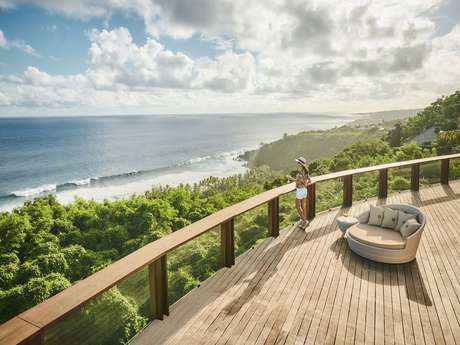 Recharge your batteries in this lush green spot, which combines luxury with tranquillity "
Reunion Island is A mixture of colours, cultures and exceptional landscapes. 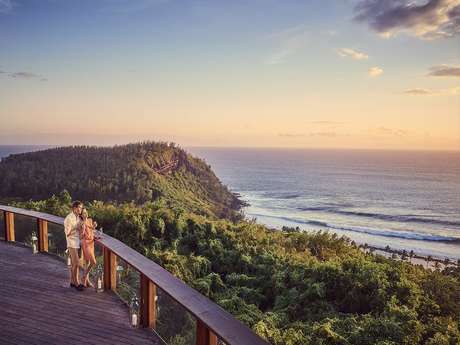 Your perfect day Breakfast at the Palm watching whales off the coast, a picnic lunch with the family at Cap Méchant and an aperitif on a catamaran at sunset. Your favourite place Grande Anse beach with its beautiful stretch of white sand. Your favourite dish Delicious palm nut fed pork from Saint-Philippe. In Petite Ile, I treated myself to an exceptional break at the Palm Hotel & Spa, a charming hotel in the middle of the countryside. An idyllic moment away from it all, to take care of my body and my mind. If you want to discover a wild yet peaceful countryside then you have to go to the South of Reunion Island. With its volcanic landscapes shaped by the waves of the Indian Ocean, that I am about to explore from my room at the Palm Hotel & Spa. The hotel sits in a tropical garden, just above the iconic beach at Grand Anse. After discovering my spacious and well designed room, I adventure into the gardens, which stretch for at least 3.5 hectares. Frangipani, mango trees, flame trees, palm trees: nature is everywhere. 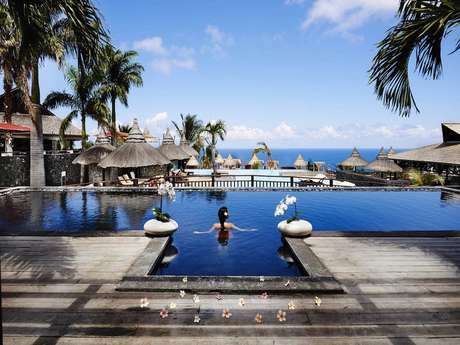 The Palm was the first hotel on the island to get the EU Ecolabel, in 2014. The hotel's commitment can be seen in the smallest details. In the bar, I also discover the Palm’s water, micro-filtered and served in a carafe, to reduce the use of plastic. I continue my exploration with the discovery of the Akéa Spa, where the zen atmosphere and nature predominate. After a massage and a session in the jacuzzi, I head to Kah Beach. This landscaped beach, with a hammam, sun loungers and four poster beds, has panoramic views of the ocean. During the southern winter, you can even see whales. It is here that I admire the sunset, sipping a delicious fresh fruit cocktail. Reading the menu for the Makassar restaurant gives me a bit of an appetite. The dishes prepared by the chef, Claude Pothin, combine products from elsewhere and local ingredients with a touch of sophistication. From the starter to the dessert, an explosion of flavours is the perfect end to this unbelievable day. After a peaceful night, I leave the arms of Morpheus for those of Nathalie, the Spa manager who is going to give me a massage in one of the hotel's pools. She shows me the Aqua Sens treatment, a combination of shiatsu and watsu, created with the help of an osteopath. On a board, in water at 28 degrees, I let myself be lulled by Nathalie’s gentle movements. As she helps me to sway gently in the water, I can feel myself letting go and my mind emptying. With my eyes closed and my ears in the water, the only thing I notice is my breath and the changes in light. Loosing my bearings is intoxicating and pushes me to listen to my body and my feelings. Being massaged in the water, "unsupported", is a completely unique feeling. There’s nothing holding my body, I’m free, floating on air … and incredibly relaxed. This treatment is just what I needed. With my batteries recharged, I’m ready for new adventures. As I’m leaving, Fabrice, from the concierge desk, advises me to head towards the Langevin river. It's an opportunity to admire one of the most beautiful waterfalls on Reunion Island and enjoy a little bit more of the incomparable beauty of this part of the island. The 1st hotel in the Indian Ocean to get the “EU Ecolabel". Protecting the environment is in this hotel’s DNA. An elegant and welcoming setting for recharging your batteries surrounded by nature and taking care of your body and your mind. Outstanding food in keeping with current trends, wherethe focus is on local produce and local producers.